Any man under thirty years of age who tells you he is not afraid of an English butler lies. He may not show his fear. Outwardly he may be brave - aggressive even, perhaps to the extent of calling the great man 'Here!' or 'Hi!' But, in his heart, when he meets that, cold, blue, introspective eye, he quakes. The effect that Keggs, the butler at the Keiths', had on Martin Rossiter was to make him feel as if he had been caught laughing in a cathedral. He fought against the feeling. He asked himself who Keggs was, anyway; and replied defiantly that Keggs was a Menial--and an overfed Menial. But all the while he knew that logic was useless. When the Keiths had invited him to their country home he had been delighted. They were among his oldest friends. He liked Mr Keith. He liked Mrs Keith. He loved Elsa Keith, and had done so from boyhood. But things had gone wrong. As he leaned out of his bedroom window at the end of the first week, preparatory to dressing for dinner, he was more than half inclined to make some excuse and get right out of the place next day. The bland dignity of Keggs had taken all the heart out of him. Nor was it Keggs alone who had driven his thoughts towards flight. Keggs was merely a passive evil, like toothache or a rainy day. What had begun actively to make the place impossible was a perfectly pestilential young man of the name of Barstowe. The house-party at the Keiths had originally been, from Martin's view-point, almost ideal. The rest of the men were of the speechless, moustache-tugging breed. They had come to shoot, and they shot. When they were not shooting they congregated in the billiard-room and devoted their powerful intellects exclusively to snooker-pool, leaving Martin free to talk undisturbed to Elsa. He had been doing this for five days with great contentment when Aubrey Barstowe arrived. Mrs Keith had developed of late leanings towards culture. In her town house a charge of small-shot, fired in any direction on a Thursday afternoon, could not have failed to bring down a poet, a novelist, or a painter. Aubrey Barstowe, author of _The Soul's Eclipse_ and other poems, was a constant member of the crowd. A youth of insinuating manners, he had appealed to Mrs Keith from the start; and unfortunately the virus had extended to Elsa. Many a pleasant, sunshiny Thursday afternoon had been poisoned for Martin by the sight of Aubrey and Elsa together on a distant settee, matching temperaments. The rest is too painful. It was a rout. The poet did not shoot, so that when Martin returned of an evening his rival was about five hours of soul-to-soul talk up and only two to play. And those two, the after-dinner hours, which had once been the hours for which Martin had lived, were pure torture. So engrossed was he with his thoughts that the first intimation he had that he was not alone in the room was a genteel cough. Behind him, holding a small can, was Keggs. 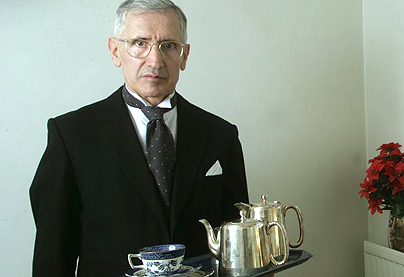 'Your 'ot water, sir,' said the butler, austerely but not unkindly. Keggs was a man--one must use that word, though it seems grossly inadequate--of medium height, pigeon-toed at the base, bulgy half-way up, and bald at the apex. His manner was restrained and dignified, his voice soft and grave. But it was his eye that quelled Martin. That cold, blue, dukes-have-treated-me-as-an-elder-brother eye. Martin had no answer. He was dazed. Keggs had spoken with the proud humility of an emperor compelled by misfortune to shine shoes. 'It is perhaps a liberty,' began Keggs. He paused, and raked Martin with the eye that had rested on dining dukes. 'Not at all,' said Martin, hurriedly. Martin's eyes and mouth opened slowly. Martin's jaw dropped another inch. Martin was conscious of one coherent feeling at the conclusion of this address, and that was one of amazed gratitude. A lesser man who had entered his room and begun to discuss his private affairs would have had reason to retire with some speed; but that Keggs should descend from his pedestal and interest himself in such lowly matters was a different thing altogether. 'I'm very much obliged--' he was stammering, when the butler raised a deprecatory hand. Martin's feelings had undergone a complete revulsion. In the last few minutes the butler had shed his wings and grown horns, cloven feet, and a forked tail. His rage deprived him of words. He could only gurgle. He stopped. The thought of these hounds, these demons, coolly gossiping and speculating below stairs about Elsa, making her the subject of little sporting flutters to relieve the monotony of country life, choked him. 'I shall tell Mr Keith,' he said. The butler shook his bald head gravely. He passed softly out of the room. It was more as a demonstration of defiance against Keggs than because he really hoped that anything would come of it that Martin approached Elsa next morning after breakfast. Elsa was strolling on the terrace in front of the house with the bard, but Martin broke in on the conference with the dogged determination of a steam-drill. 'Coming out with the guns today, Elsa?' he said. She raised her eyes. There was an absent look in them. 'I used to like dolls,' she said, impatiently. Mr Barstowe gave tongue. He was a slim, tall, sickeningly beautiful young man, with large, dark eyes, full of expression. 'I am going out in the motor with Mr Barstowe,' said Elsa. 'Mr Barstowe was speaking figuratively,' said Elsa, with disdain. 'I'm afraid you haven't,' said Elsa. There was a brief silence. A bird made itself heard in a neighbouring tree. '"The moan of doves in immemorial elms,"' quoted Mr Barstowe, softly. 'Only it happens to be a crow in a beech,' said Martin, as the bird flew out. Elsa's chin tilted itself in scorn. Martin turned on his heel and walked away. 'I believe you are the devil,' said Martin. Martin shot abominably that day, and, coming home in the evening gloomy and savage, went straight to his room, and did not reappear till dinner-time. Elsa had been taken in by one of the moustache-tuggers. Martin found himself seated on her other side. It was so pleasant to be near her, and to feel that the bard was away at the other end of the table, that for the moment his spirits revived. She looked at him--once. The next moment he had an uninterrupted view of her shoulder, and heard the sound of her voice as she prattled gaily to the man on her other side. He looked up into Kegg's expressionless eyes. The butler was wearing his on-duty mask. There was no sign of triumph in his face. This was awful. He must put this right. She was engrossed in her conversation with her neighbour. From down the table in a sudden lull in the talk came the voice of Mr Barstowe. He seemed to be in the middle of a narrative. 'I beg your pardon?' she said, very sweetly. And once more the world became all shoulder. When the men trailed into the presence of the ladies for that brief seance on which etiquette insisted before permitting the stampede to the billiard-room, Elsa was not to be seen. There was an early start for the guns next morning, and as Elsa did not appear at breakfast Martin had to leave without seeing her. His shooting was even worse than it had been on the previous day. It was not until late in the evening that the party returned to the house. Martin, on the way to his room, met Mrs Keith on the stairs. She appeared somewhat agitated. Mr Keith was a man who had built up a large fortune mainly by consistently refusing to allow anything to agitate him. He carried this policy into private life. 'Wasn't she in at lunch?' he asked, placidly. 'Would you put back dinner, do you think?' inquired Mrs Keith, anxiously. Elsa did not come back for dinner. Nor was hers the only vacant place. Mr Barstowe had also vanished. Even Mr Keith's calm was momentarily ruffled by this discovery. The poet was not a favourite of his--it was only reluctantly that he had consented to his being invited at all; and the presumption being that when two members of a house-party disappear simultaneously they are likely to be spending the time in each other's society, he was annoyed. Elsa was not the girl to make a fool of herself, of course, but--He was unwontedly silent at dinner. Mrs Keith's anxiety displayed itself differently. She was frankly worried, and mentioned it. By the time the fish had been reached conversation at the table had fixed itself definitely on the one topic. 'I can't understand it,' said Mrs Keith for the twentieth time. And that was the farthest point reached in the investigation of the mystery. By the time dinner was over a spirit of unrest was abroad. The company sat about in uneasy groups. Snooker-pool was, if not forgotten, at any rate shelved. Somebody suggested search-parties, and one or two of the moustache-tuggers wandered rather aimlessly out into the darkness. Martin was standing in the porch with Mr Keith when Keggs approached. As his eyes lit on him, Martin was conscious of a sudden solidifying of the vague suspicion which had been forming in his mind. And yet that suspicion seemed so wild. How could Keggs, with the worst intentions, have had anything to do with this? He could not forcibly have abducted the missing pair and kept them under lock and key. He could not have stunned them and left them in a ditch. Nevertheless, looking at him standing there in his attitude of deferential dignity, with the light from the open door shining on his bald head, Martin felt perfectly certain that he had in some mysterious fashion engineered the whole thing. Kegg's voice took on a sympathetic softness. Mr Keith clutched at his forehead. 'I think it 'ighly possible, sir, that Miss Elsa and Mr Barstowe may be on the hisland in the lake, sir.' About half a mile from the house was a picturesque strip of water, some fifteen hundred yards in width and a little less in length, in the centre of which stood a small and densely wooded island. It was a favourite haunt of visitors at the house when there was nothing else to engage their attention, but during the past week, with shooting to fill up the days, it had been neglected. Keggs shook his head deprecatingly, as one who, realizing his limitations, declines to attempt to probe the hidden sources of human actions. 'I thought it right, sir, to let you know,' he said. He dashed off excitedly into the night. Martin remained for a moment gazing fixedly at the butler. 'Do you know what I should like to do to you?' said Martin slowly. Martin gave up the struggle with a sense of blank futility. What could you do with a man like this? It was like quarrelling with Westminster Abbey. His surmise proved correct. When Martin came up he found his host seated on the ground in evident pain. Martin did as he was requested--so far, that is to say, as the first half of the commission was concerned. As regarded the second, he took it upon himself to make certain changes. Having seen Mr Keith to his room, he put the fitting-out of the relief ship into the good hands of a group of his fellow guests whom he discovered in the porch. Elsa's feelings towards her rescuer might be one of unmixed gratitude; but it might, on the other hand, be one of resentment. He did not wish her to connect him in her mind with the episode in any way whatsoever. Martin had once released a dog from a trap, and the dog had bitten him. He had been on an errand of mercy, but the dog had connected him with his sufferings and acted accordingly. It occurred to Martin that Elsa's frame of mind would be uncommonly like that dog's. The rescue-party set off. Martin lit a cigarette, and waited in the porch. Martin threw away his cigarette and went indoors. Elsa Keith sat up as her mother came into the room. Two nights and a day had passed since she had taken to her bed. 'Then I can get up,' said Elsa, thankfully. Martin had not gone out with the guns that day. Mrs Keith had assured him that there was nothing wrong with Elsa, that she was only tired, but he was anxious, and had remained at home, where bulletins could reach him. As he was returning from a stroll in the grounds he heard his name called, and saw Elsa lying in the hammock under the trees near the terrace. 'Why, Martin, why aren't you out with the guns?' she said. Elsa fluttered the pages of her magazine. Elsa was sitting with her eyes closed and a soft smile of pleasure curving her mouth. 'Go on,' she said, dreamily. 'Isn't it _lovely_?' she murmured. Her hand, as it swung, touched his. He held it. She opened her eyes. He bent towards her. She smiled at him. Her eyes were dancing. Martin started away. He glared up furiously. Gazing down upon them stood Keggs. The butler's face was shining with a gentle benevolence. 'I'll come at once,' said Elsa, stepping from the hammock. The butler bowed respectfully and turned away. They stood watching him as he moved across the terrace. The Good Angel by P G Wodehouse. If you want to know more about the author, click HERE.